Marimekko + Xerea + giveaway!!! Hi, guys! Happy Monday! Hope your day is off to a good start! OK, I am sooooo excited to show you this dress, so I’m just gonna dive right in! As you can see, this is a really large-scale print! It’s probably intended to be used for things like curtains instead of clothing, hence the huge scale, but I’m not one to shy away from a big ol’ print! I almost chose something with a smaller scale, but I’m glad I didn’t- this one really makes a statement! For this ’60’s-esque print, a ’60’s-esque silhouette seemed like the right thing to do, so I decided to make another Pauline Alice Xerea dress. I’ve been wearing my first version so much that I was really eager to make another! I enjoy seeing the way that one pattern looks when it’s made up in different fabrics. Since this fabric is much heavier and crisper than the barkcloth I used before, it really holds the tent shape! I love it, actually, although I totally get that this look isn’t for everyone. I thought quite a bit about print placement for this dress. I didn’t want to break up the print too much, but I also wanted to feature all the different colors in the repeat. I’m pretty happy with the way it turned out, although, really, I think I would have been happy no matter how I used the print! It’s just so cheerful! I’m especially fond of the little eyeball-shaped bits by the pink flower… they’re so Muppet-y! Get this: Man Friend likes this dress! I know… it’s shocking! That’s a pretty big win, in my book! OK, now for the fun part! A giveaway! 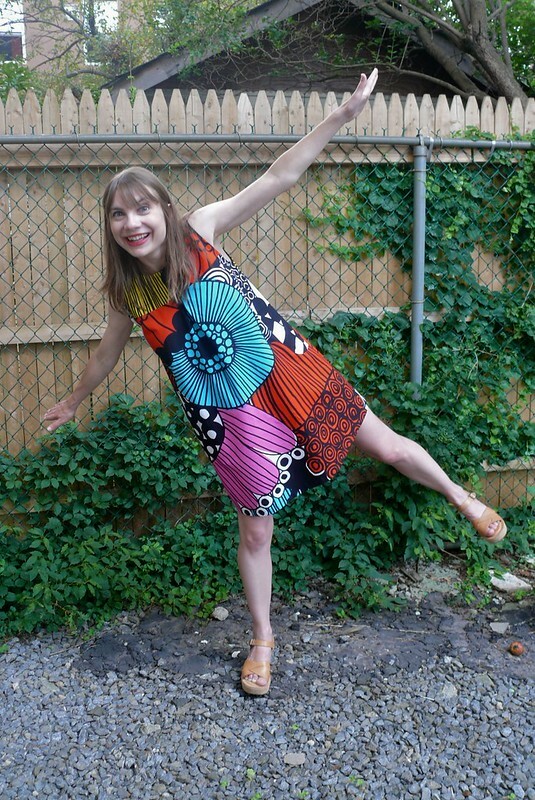 AlwaysMod is giving away two yards of the fabric of your choice, yay! Unlike most of the giveaways I do on the blog, they’re dealing with all the logistics, so you can head over here to enter for a chance to win! The only catch is that you need to sign up for their newsletter, but you can unsubscribe whenever you want to so you’re not locked into a marriage with them or anything like that. 🙂 They’ll pick a winner on or around August 25th. Good luck, everyone! In the meantime, here’s a YouTube video that I stumbled across that shows the printing process in the Marimekko factory in Helsinki- I found it totally fascinating! Anyone else have a sudden urge to do some screenprinting?! *Fabric was given to me by AlwaysMod.com to review. I super love it. No affiliate links in the post. 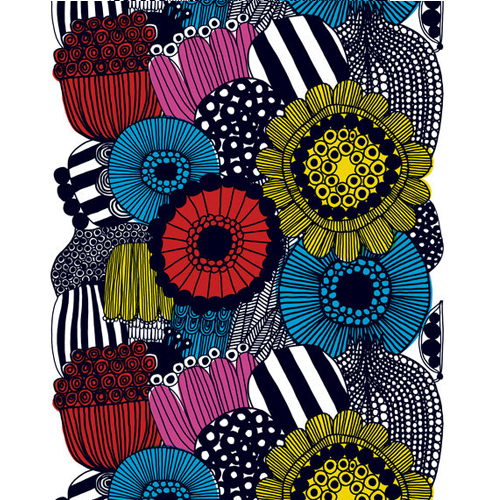 I’m so glad I could introduce you to Marimekko! It’s so, so cool! Big prints are fun. I do like the silhouette with the fabric structure. It’s different. Woo this is fab, Sonja! The print is very >you< ! Just popping in to say I love this dress! Fabric and style look great on you! Wow, fantastic! I bought Marimekko fabric in Sweden a few years ago and it’s still sitting in my stash because I can’t figure out what to do with it! You totally did the big print justice, bravo! how did i miss this?! its SO good. Thank you! It really is a nice pattern! I hope you love it! It looks like it! Of course your fabric choice would make a toaster cozy look sensational! You know, a post of yours from a couple of years ago got me started on Vlisco fabric… now I have another fabric designer to get to know! Woohoo! Thanks again!